Transport Canada has acquired three MSS 6000 systems. The systems are used to help protect Canada’s ocean resources for the benefit of coastal communities while protecting fragile marine ecosystems. The systems serve to detect, classify and track all targets of potential interest, one example being marine oil spills. This results in Transport Canada having a very capable surveillance capacity, which significantly enhances the effectiveness of the National Aerial Surveillance Program by allowing for more effective enforcement of Canada’s domestic pollution legislation. The three systems enable Transport Canada to track and identify polluters in all weather conditions on a 24 hour basis. Canada’s first MSS 6000 system was taken into operation in 2006 and is used primarily to conduct pollution surveillance in the Atlantic, Quebec and Ontario regions. The second system, which was deployed in January 2008, is used for surveillance over Canada’s West Coast and Western Arctic Waters. The third system was taken into operation in June 2009, installed on board the Dash 7 aircraft. This aircraft will conduct surveillance operations in Canada’s Arctic during the shipping season and over Canada’s Great Lakes during the remainder of the year. “We are very excited about ordering the third MSS 6000 as it is in line with our vision of having three of Canada’s oceans protected with three similarly equipped aircraft. The first system is providing us with an array of quality data that has exceeded our expectations and we look forward to commissioning the second and third systems. 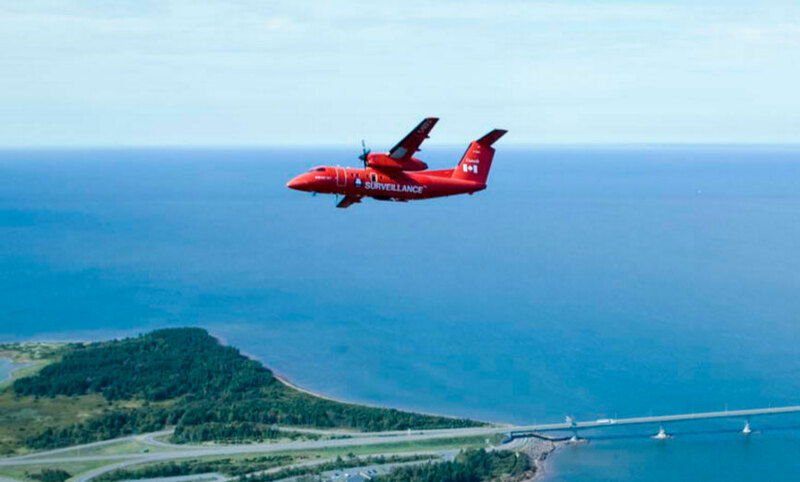 We really appreciate the continued support from the SSC team,” said Louis Armstrong, then Program Manager for Transport Canada’s National Aerial Surveillance Program and the technical authority for procurement contract. The aircraft will be capable of operating in all weather conditions and during hours of darkness or reduced visibility. Transport Canada plans to conduct 25 to 30 per cent of its pollution patrols during hours of darkness, as this is when many illegal discharges are expected to occur. (Note the lookout window on top of the aircraft, for operator/observer situation overview, a feature that makes this Dash 7 unique). The systems for Canada consist of a SLAR (Side-Looking Airborne Radar); an IR/UV (Infrared/Ultraviolet) line scanner; an Airborne AIS (Automated Identification System) for receiving ship identity information; an electro-optical infrared camera system, a satellite communications system, a high-resolution digital photography camera and a video system for visual documentation for evidence purposes. Data from all systems is processed, integrated and presented in one integrated view to the operator. All recordings are annotated with GPS data and digitally stored in an onboard geographical database. Data and digital images are presented integrated with an electronic nautical chart database, and also correlated with the mission report, all at the fingertips of the user, to ensure maximum efficiency during routine surveillance as well as in emergency situations. The MSS 6000 software will further allow transmission of data to the ground in real time as well as replay and analysis of the recorded mission on a separate ground work station.